September 11, 2012 was a bittersweet day on South Padre Island. 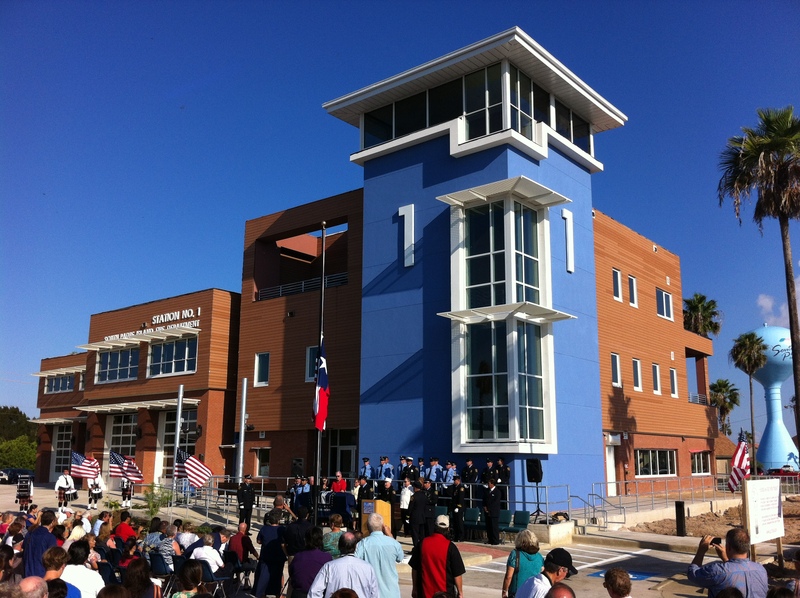 As the city remembered the fire fighters and other fallen heroes of the World Trade Center attacks, they also gathered at 106 West Retama Street to dedicate their new central fire station. The 20,000 square foot building was the long-awaited replacement for the old fire station that had been badly damaged by Hurricane Dolly in 2008. State Senator Eddie Lucio, Jr. spoke at the dedication. American and Texas flags were raised for the first time on the station’s flagpole then slowly lowered to half-mast. A steel beam that had been removed from the World Trade Center rubble was on permanent display in the public plaza in front of the station. Chief Burney Baskett said that the beam will be a reminder of “the deadliest day in the history of the United States Fire Service”. The distinctive form of the three-story building reflects the need for the emergency operations center (EOC) to remain high off the ground and functional during harsh weather conditions as well as the demand for a compact building footprint due to high property values. BRW aimed to provide a building that neither compromised on durability nor stood out as a bunker among the festive buildings on the island. That goal was achieved by a two-part solution. First, a cast-in-place concrete structure with reinforced concrete block infill was designed to provide a tough exterior shell. Second, the upper floors were clad with a warm wood-composite rainscreen system which, during a storm, will equalize air pressure and obstruct driving rain.